MYA XFunction Technology comes standard in the new MYA Brina along with our new interchangeable stem design system. Boosting many different color options with a choice of frosted or classic solid colored glass coupled with our new interchangeable stem system the combinations are endless. Addon the new MYA Fornello to complete the hookah with the ultimate and newest hookah technology on the market! 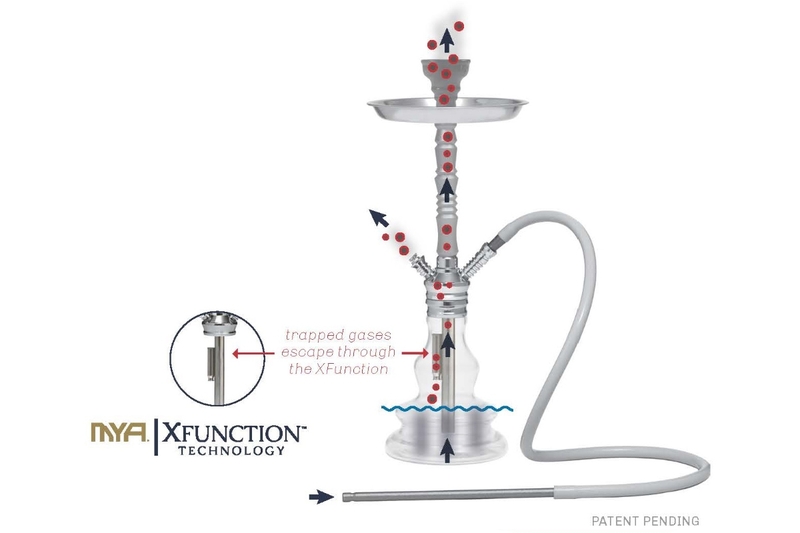 Brina by MYA®, part of our new line of XFunction hookahs, is remarkable in its own right and is sure to catch the eye of all those whom see her whole 22” stature. Brina comes standard with the patented MYA® screw in stem system. She will arrive packaged in a newly designed luxury MYA® box paired with a matching stem and hose along with our new 390 burner. Brina has a multi-hose stem capability (customizable for up to four hoses at once) making it the perfect social statement piece. Brina can also be mixed and match with the bases and stems covers using different colors, shapes, textures, and designs to your personal preference. Unlike any other MYA®, the Brina has an extraordinary feminine and soft base curvature showcasing her exalted figure reflecting her namesake. MYA® makes our name in the industry by always thinking about versatility and originality. MYA® for decades has been determined to provide statement pieces that speak to you through us including the new XFunction™ Technology, our new distinctive bases, and our interchangeable stem system; which all come standard with Brina by MYA®.